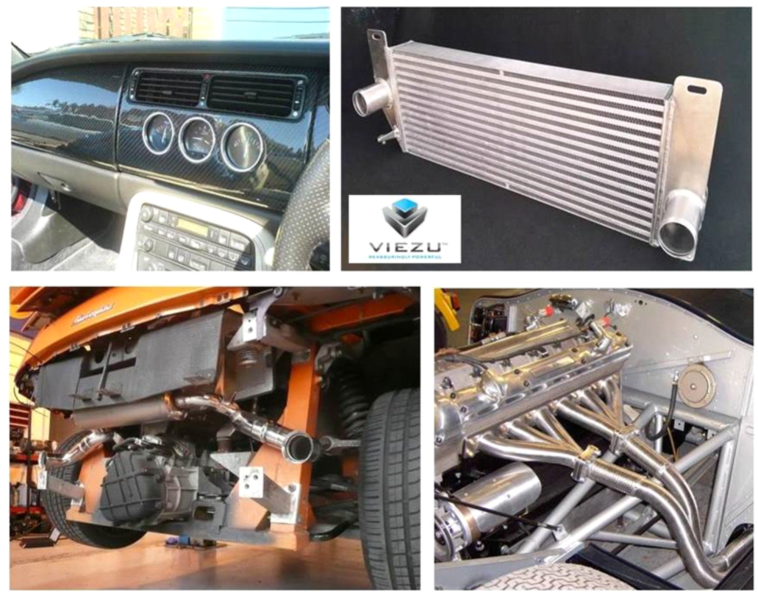 As well as the very significant range of off the shelf tuning parts and services from the industry’s leading manufacturers and suppliers Viezu can also arrange some very special fabrication services. Special projects of this nature can include items like Exhaust systems, Intercoolers, air induction, manifolds and hoses all designed to your specific requirements. All of these items can be manufactured on a one off single item basis, or small production runs and batch manufacturing ideal for limited editions, or run-out model special versions, interior and exterior trim and styling items can also be developed and sourced, as can custom upholstery, carpentry and tailoring. Including wooden and carbon fibre dashboards etc. Custom fabricated items can be developed and built as single items, or can be supplied and built as part of a package of modifications or upgrades, including items like larger turbo kits, injectors, ecu remapping, supercharger pulleys, exhaust systems, brakes, paintwork, suspension and more either for a single vehicle or a run of limited edition vehicles or group of vehicles.